Yesterday was probably the last really dry day of the season. The rain came down today in heaving great buckets, good for the fungi crops to come but no fun to dig spuds in. Luckily I took the last of the serious crop before it came. We've had a pretty good year for potatoes. 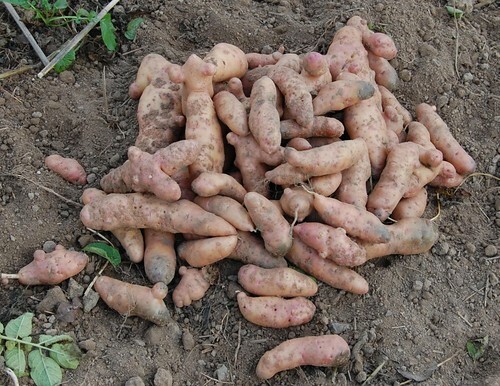 Everything grew, blight was nearly non-existent and it's been easy to dig the tubers from the dry soil. This pile of Pink Fir Apple is the yield from about 3 plants. We have boxes of them and I'm waiting for some hessian sacks to arrive from the UK so that they can be stored more appropriately. We're going to hang them from the roof beams this year to avoid the losses to rodents experienced last year. I also took up the donated New Zealand Blue potato and some of the Vitelotte for a comparison. There's really nothing to show between the two of them. This is one of the issues I have with saving the so called 'heirloom' varieties. There is no way of knowing what you have, or that what you have is true to type or that saving it will make the slightest bit of difference to anything in the long run. I can't tell if these two examples of potatoes are sufficiently genetically different to justify their two names and actually, based on the evidence of my eyes, I'd say they definitely weren't. 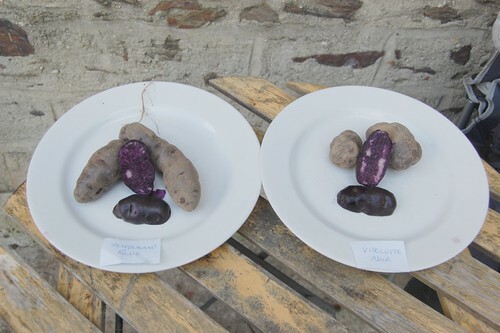 There does appear to be a slight difference in tuber shape but I'm pretty sure the original Vitelotte showed a longer tuber and I know that the plants I grew this year weren't in particularly good soil or healthy to begin with. The differences could be purely down to that. I couldn't even find a variety listed as New Zealand Blue (or any German rendition of it) when I researched in the spring - it has to be a case of mislabelling or mis-identification. Since I'm not really in the business of saving potato varieties I'll probably let it go. The real issue for me is that it's not just in the area of potatoes this problem exists. 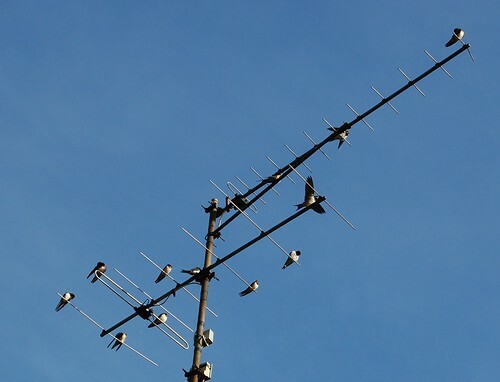 I was going to write that the swallows left yesterday morning, but as I sit here typing half a dozen of the naughty birds are flying like maniacs around the yard. I don't know whether they left and turned back because of bad weather or if these are just some stragglers passing through. It's a good two weeks later than our nesting group normally set off south from these parts, we think they stayed longer to allow a late brood to build up strength, but they must surely leave soon, it's definitely becoming more than a touch autumnal around here. When I got back from vacation I found a potato in my cupboard that had turned into medusa. Instead of throwing it away I stuck it in the ground and there it has been growing for these past three months. I'm anxious to see what's there when I finally dig it up.